The 76 Piece AAA Excursion Road Kit comes standard with heavy-duty 8 gauge 10 foot jumper cables and a 9 LED aluminum flashlight. 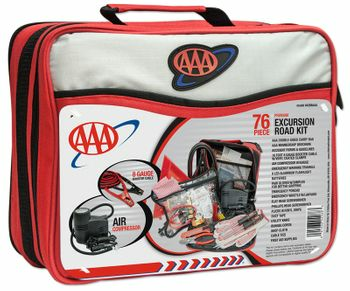 The included AAA car care guide provides basic instruction for many roadside problems. 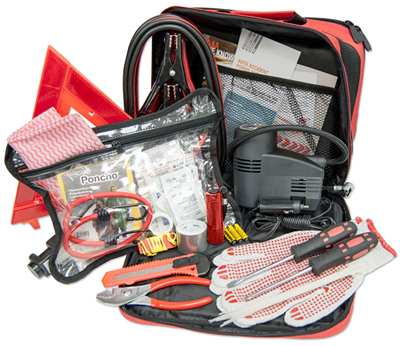 This deluxe kit also includes a reflective triangle with a sand filled base which folds for easy storage, a 250 PSI air compressor, standard and Phillips screwdrivers, slip joint pliers, a 45 piece first aid kit, and more. All of this comes in a durable, fully padded bag with a separate pocket in the back for your jumper cables and pockets in the front compartment for easy storage. AAA kits stand for quality and performance. Dimensions: 13½" x 10" x 6"